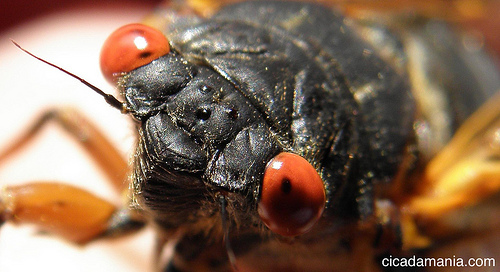 With piercing red eyes and a song like the soundtrack from a 50’s science-fiction film, the 17-year cicadas have stormed up out of the soils of the Eastern seaboard of the U.S. for their single month or so of adult life. Though their brief otherworldly chorus is, in human terms, ancient, only over the last century have Americans started to listen less with rank fear, more in annoyance or wonder. Change was nevertheless afoot in attitudes toward these insects, starting with a new insistence about the name: not true “locusts” – a term increasingly reserved for grasshoppers, with more prominent hind legs – these pudgy bugs with the veined wings instead should be known only as “cicadas.” From the late nineteenth into the early twentieth century, scientists, many of them working for new federal initiatives against agricultural pests, generated more precise knowledge about the cicada’s feeding habits as well as its periodicity and broods. They spread word that the mature insect “will not damage the foliage of shade trees,” though they did warn that “sprigs of young trees” could be affected – a caution still sounded, if mutedly, today. What saved the 17-year-cicada, to enable its remarkable flourishing around D.C. in spring of this year, was not just its own adaptable hardiness but the new way this and other American cities themselves had begun to grow: by suburbanizing. Even as paving and building drove cicadas from downtowns, farms and factory towns along city edges came to be replaced by a less dense, more dispersed style of housing. While small-lot suburban developments could destroy those mature trees on which the cicada’s life cycle depended, as noted in a recent report by Atlantic Cities’ Emily Badger, developers of the more affluent suburbs often turned towering hardwoods into a selling point. At least as important, those moving into such places could have a more appreciative attitude toward surrounding woods than their agricultural predecessors. They might push to turn forest patches into parks, or for zoning that would keep denser development out. They might even find cause to marvel at the lives of local insects. Such was the case with Robert Cushman Murphy, a long-time resident of Long Island and ornithologist for the American Museum of Natural History, who retired in 1952 and moved into an elite incorporated village called Old Field. Its suburban lots – zoned for two acres or more – grew far more mature trees than in 1900, an inviting habitat for the 17-year-cicada. “Brood 14 is here again,” he wrote in his journal in early summer 1957. He welcomed the cicadas’ return without hint of fear or disgust, in an extended reminiscence about the few times he had seen them before, starting when he heard them on the way to high school in 1906. Scientist that he was, Murphy’s fascination with the cicada also betokened a sea-change in popular attitudes toward insects, in which not just Murphy but others on suburban Long Island stood in the vanguard. Eschewing pesticides, they had taken up what was coming to be known as organic gardening. Only months after the 17-year cicadas had arrived, Murphy joined some thirteen others, some organic gardeners and all suburbanites, in a lawsuit against a federal spray campaign targeting the gypsy moth. Thus was born the first widely publicized court case against DDT. Its litigants and arguments would prove indispensable to Rachel Carson, just then starting her Silent Spring (1962). Murphy did not just rail against the dangers of DDT, he also downplayed Long Island infestations of the gypsy moth, insisting that since they remained ecologically in check, they posed little threat. By this time, 17-year cicada broods had largely abandoned the downtowns of our major cities. Around New York City, the 1962 emergence of brood II remained strong only in Staten Island, that most suburban of the boroughs then as now. Few turned up in Nassau and Westchester, as well, suggesting denser, newer versions of suburbanizing had helped drive the cicada out. Ultimately, however, Westchester and other older suburbs – as well as upper-end newer ones that retained preexisting trees – provided the cicada with enclaves that lasted. Today, maps of 17-year cicada reports convey a clear message: outside NYC itself from Westchester to New Jersey, also out from Washington, D.C., suburban and exurban counties have enjoyed far more official sightings either than the downtowns or more rural areas. Why? Acre per acre, they contain not only more and bigger plants, but the leafier and more mature trees that this breed of cicadas likes. Residents of such places may find the cicadas more trouble than treat, but what they do like, less ambivalently, are those visibly greener, older, and more ecologically complex fragments of woodland where cicadas thrive. The good news is that widespread taste for living next to this visibly richer nature has preserved not just the cicadas but many less noted wilder species. There’s also a more disturbing message here, however: what the pattern of cicada sightings say about who in our society gets to enjoy these more genuine slices of the natural world. Once you lay the pattern of 17-year-cicada sightings over the economic geography, you can see it: those less disturbed patches of forest greenery where cicadas thrive closely correlate with where the incomes and housing values are higher. On Staten Island three cycles ago, in 1979, biologist Christine Simon was noting how that cicada broods was vanishing from the northern and westerly corners of the island – with the lowest incomes – and becoming more confined to the center, south and east. 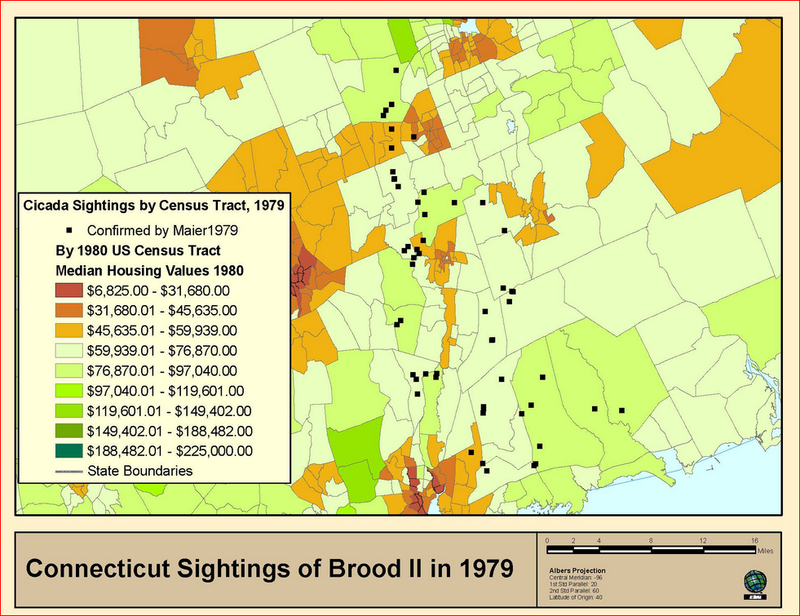 Records of that same brood’s emergence in Connecticut, when correlated with housing values, also point to this socioeconomic skewing. Mapping of the emergence now underway, the most precise and comprehensive ever, coming in the wake of three decades of widening economic inequality, may well show a still greater concentration in wealthier neighborhoods. Along the eastern seaboard by the summer of 2013, what separates the haves from have-nots is not just cash or property but the cicada’s song. I have been wondering where these red eyed buzzards were. I live in a suburb of Baltimore and have yet to “see” one shell or bug. Today, I am hearing them. Not in great chorus, but I know they’re out there somewhere. Somewhat dissappointed at the diminished numbers.